This is part 2 of the Nutanix XCP Deep-Dive, covering the Nutanix platform hardware architecture. 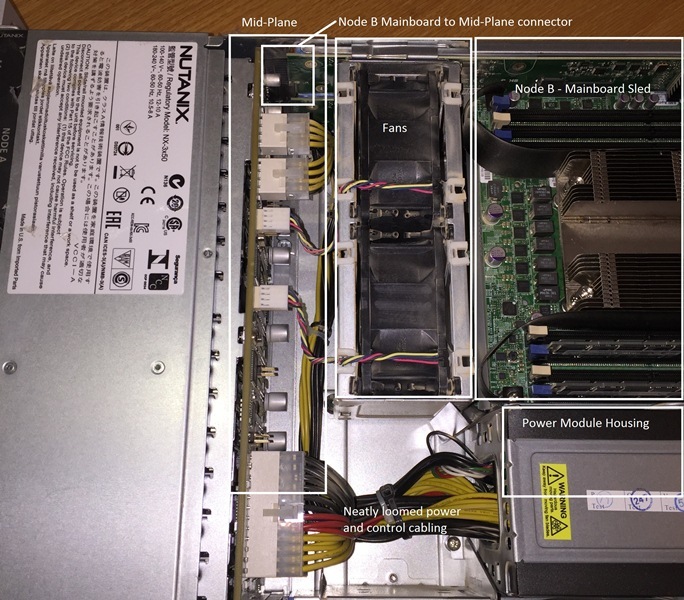 The complete breakdown of the Nutanix (SuperMicro OEM) platform is described in the Hardware Administration and Reference document (need a valid support contract to access). The current Nutanix Hardware Platform page describes the most current models. The Dell website covers their offering of the Nutanix Dell OEM models as well. I have taken the information from all of these sources and created a quick reference spreadsheet. 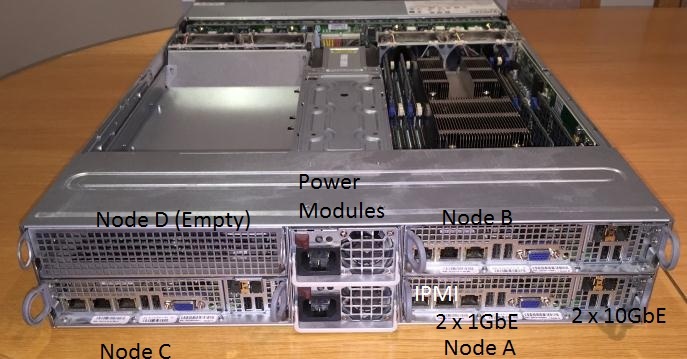 As my NPX design evolves and I get more information, I will add performance and usable capacity columns for each model. Updated with corrections and Power/Cooling columns. Note: NX-8150 datasheet does not list 10GBase-T, however the Hardware Admin and Ref. document does, so it has been included. 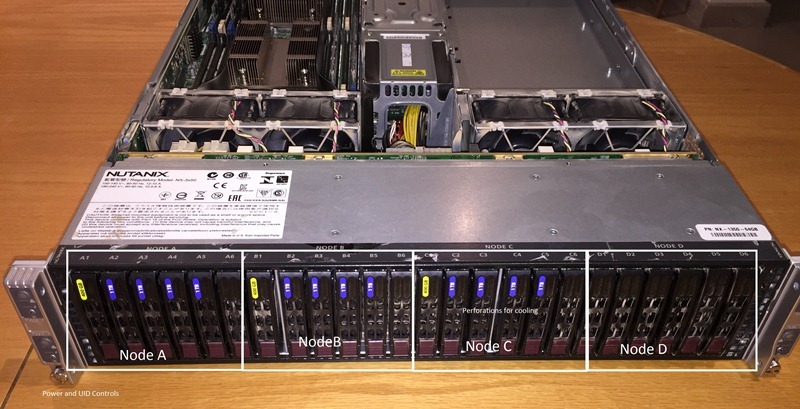 Notice how the length of the block is designed to allow up to 4 nodes plus associated hardware to fit into a 2 Rack Unit space and still fits into a standard server rack? Notice how the ears of the block are also the Power and UID controls? Notice how the mid-plane is also the power distribution and cooling control plane? See how the mid-plane is fabricated as a single printed circuit board, but is actually 4 separate connection domains for storage (one for each node) and one power distribution plane? See how the redundant power supplies are stacked in the center of the block with the shortest power cables to the mid-plane? Notice how all of the internal cabling is neatly loomed and tied down? See how the SCSI controller is vertically mounted and the end of the printed circuit board plugs directly into the mid-plane. 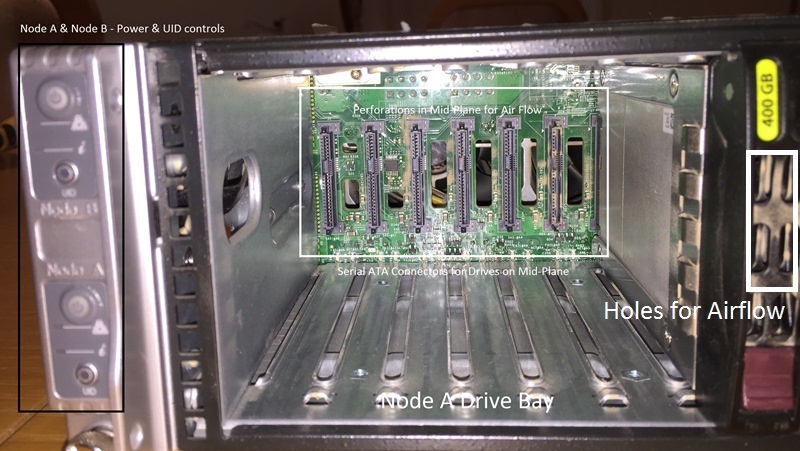 The CVM takes control of this SCSI Controller PCIe slot via Pass-Through mode. 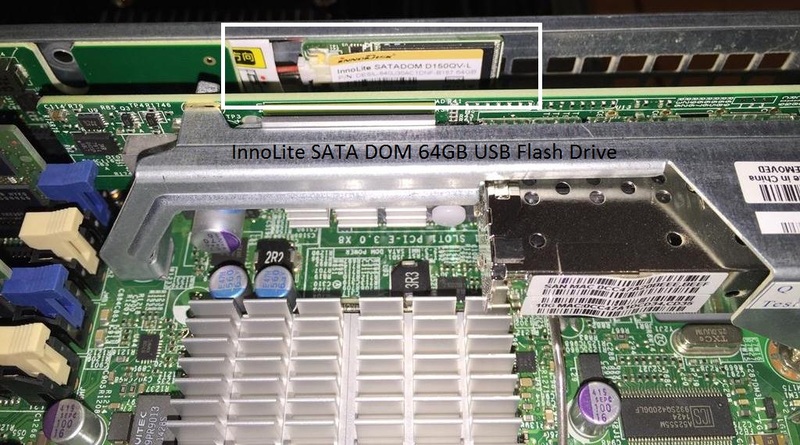 Notice how the InnoLite SATA DOM 64GB Flash Drive is vertically mounted near the SCSI controller and plugged into a USB socket on the Node mainboard? 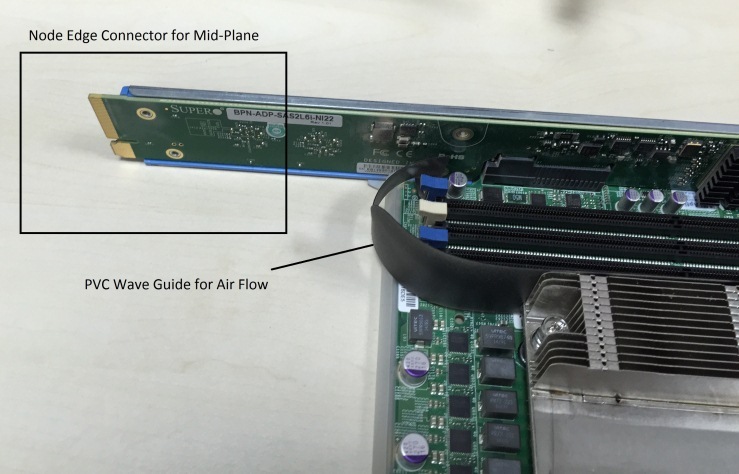 Notice how the SSD and SATA drives plug directly into the mid-plane? Notice the perforation of the SSD/SATA drive bezels to allow air to be sucked into the front of the chassis, first cooling the SSD and SATA drives before continuing to the rear of the chassis. Notice how the mid-plane has cut-outs to allow the air to continue to the rear of the chassis. Notice how the side of the block has perforations for additional air to be sucked in. See how the fans are strategically placed to allow the optimum airflow from the front to the rear. Notice how the power supplies have their own fans for cooling? Notice the PVC wave guide to optimise the cooling of the CPUs, which are directly inline for the cleanest airflow. See the Venturi effect (think airplane wing), so that the greatest suction and airflow will occur through the CPUs, which are the hottest part of the chassis? 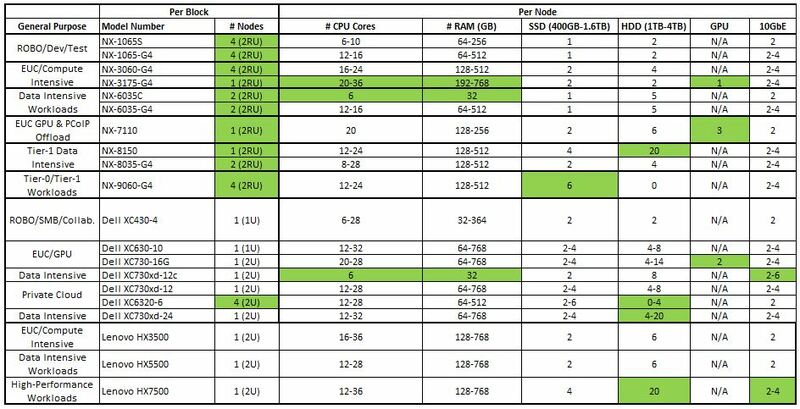 Notice how the 12 DIMM banks are equally split on either side of the CPU sockets as close as possible for lowest memory access times?